Our dog, Shiner, has a couple of "bad habits". One of them is drinking water from the toilet. She loves it. Much to my dismay, it's like toilet water is a delicacy to her or something. I'm not a fan for many obvious reasons. First of all, toilets are gross. I mean, that's where us humans in the house do our business and I'd rather not have the dog drink out of a toilet. We have five humans in my house and one bathroom. The toilet gets dirty fast. Yuck. Second, I have to use harsh chemicals to get the toilet clean. I also don't want Shiner to drink after that. We have well water, which has a lot of minerals in it and it leaves buildup and stains the toilet. Scrubbing hard water limescale build-up off of your toilet is no easy task. In fact, I've never been able to get the toilet perfectly free of a ring no matter how hard I try because of the limescale and mineral build-up. This post is sponsored by Self-Cleen. We are being compensated to help spread the word about Self-Cleen Toilet Ring Repellent, but Pawsitively Pets only shares information we feel is relevant to our readers. Self-Cleen is not responsible for the content of this article. A few weeks ago, I was approached by a company with a product that intrigued me. 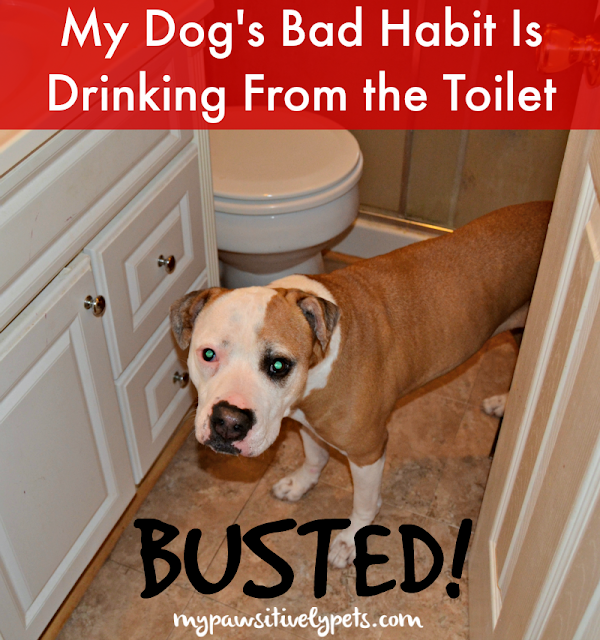 While this is not the type of product I usually talk about on the blog, I saw it and thought it was a perfect fit for us with the dog's bad habit of drinking from the toilet and all. So, I've been using it for a couple of weeks now. What is this product? 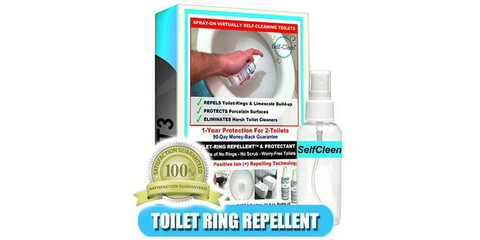 It's Self-Cleen™ Toilet Ring Repellent & Protectant. In short, this stuff is supposed to keep limescale buildup and scum off your toilet for up to 3 months so you can spend less time cleaning with harsh chemicals. It's pet-safe once it's applied to the toilet bowl too, so you can feel a little better if your dog or cat decides they'd like a toilet cocktail every now and then. 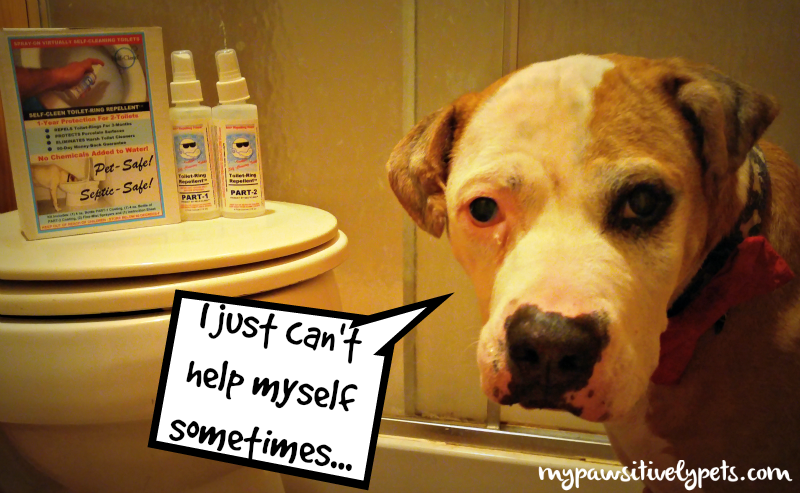 Prevents pet exposure to unhealthy household chemicals found in toilets. No chemicals added to toilet-water – pet-safe and septic system safe. Eliminates the need to use harsh toilet bowl cleaners, lime remover chemicals and calcium remover chemicals. Prevents toilet-rings and hard water build-up for 3-months at a time. Toilets become virtually self-cleaning – swish bowl once a month with distilled white vinegar. 1 Kit provides protection for 2 toilets for 1 year. This is definitely one of the most interesting and unique products I've tried before. I'll be honest. At first, I was skeptical. I had a lot of questions and wasn't sure about using it or if it would work. But I have to say that I am pleasantly surprised at how well it's working to keep my toilet clean. The toilet seems oddly clean and more or less the same as it did after I cleaned it a few weeks ago. I'm impressed! The Self-Cleen Toilet Ring Repellent & Protectant comes with a 2-part kit of spray bottles. It's not a cleaner. You follow the directions and apply a sort of sealant to your toilet bowl after getting it nice and clean. This sealant repels all that stuff you don't want sticking to your toilet bowl. The only downside I found to the process of using Self-Cleen Toilet Ring Repellent & Protectant was that it needed to dry for a few hours. That can be tricky to time in a household of five with only one toilet. Caught in the act, which is why this photo is blurry. Even though I'd rather she didn't, I'm a little more relieved when I hear the dog lapping at the toilet bowl. I try to discourage her from doing it as much as possible, but it seems inevitable most of the time. She knows how to open the bathroom door, and no one in the house seems to remember to close the lid on the toilet when they are done. I'm still quite surprised at how clean the toilet has managed to stay since I've applied the Self-Cleen Toilet Ring Repellent & Proctectant. Usually, it starts getting dirty after about 3-4 days from when I cleaned it last. This is a unique product that I'm happy to have stumbled upon. If you'd like to learn more about Self-Cleen and their products, you can visit their website HERE. 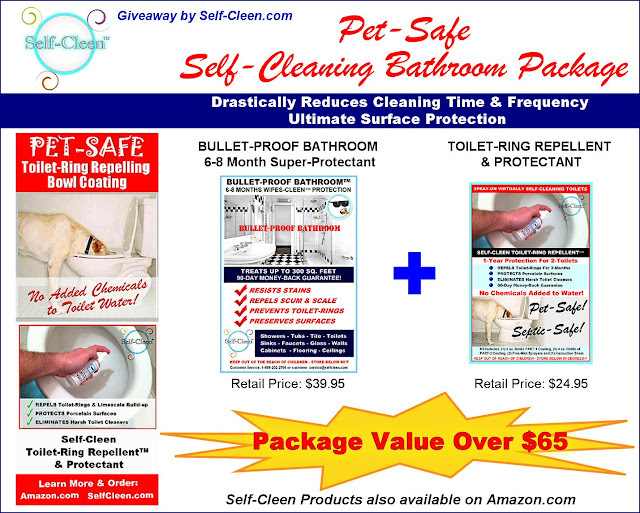 Self-Cleen Toilet Ring Repellent & Protectant is available for purchase on Amazon. Self-Cleen is offering this prize package of their product valued at over $65 to 3 winners! This giveaway is open to continental US residents only (void where prohibited by law), ages 18+. Giveaway ends on 11/18/2015 at 11:59 CT. To enter, just fill out the Rafflecopter form below with as many entry options as you like. Good luck! that could be the solution for my momma! I don't drink from the toilet bowl, I only pee on that thingy when I'm angry ...maybe the white vinegar helps to avoid such com-peee-titions? Oh well I'm glad Shiner doesn't do that at least! Not sure if the vinegar helps with that sort of thing. I think it's to help disinfect every now and then. I used to have the same problem, but luckily where we live now, the bathroom is upstairs, and the huskies don't go up there because it is the cats domain LOL! That's an interesting product! Many dog owners have that same problem. I would like to try this because I too have toilet visitors in my home! That sounds wonderful guys! I can hardly get my kids to do simple everyday tasks sometimes lol. We keep the lid closed too. Since it's just my hubby and I, our toilets stay closed most of the time. But we get that awful buildup from minerals too and it's impossible to keep them clean. I don't like using harsh chemicals, just to be on the safe side for all of us. This product really sounds interesting! Yea, that's my main problem is all the mineral build-up. My mom used to tell me there was only one cleaner that could get it off the toilets and I wish I could remember what she said it was. I know it was a chemical product. Okay, okay we know cats do it too. Luckily, our lids are always down, so we have never tried toilet water. I bet it would be good, but Mom is not thinking it would be a good idea to try it. Cool product! If you can't beat 'em, you gotta work with 'em. for one thing i hate cleaning bathrooms and toilets, so this would make it easier to keep clean and another i dont like using chemicals in my house around my dogs, even though they are not tall enough to get in the toilet. 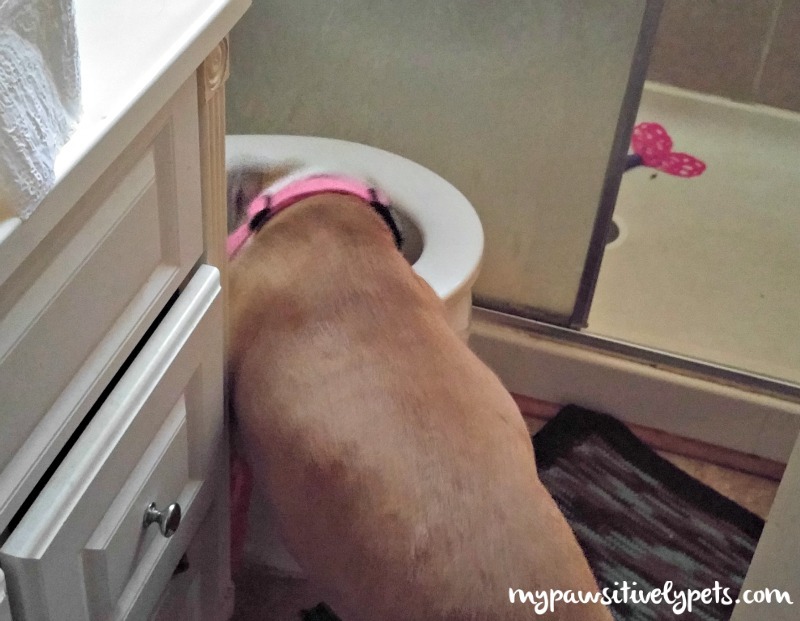 I don't know what it is about toilet water but Laika has the same nasty habit. I almost always remember to close it, but my boyfriend on the other hand.. I usually have to point out why she was able to get into it in the first place lol. Cool product, too, I haven't been able to come up with a way other than blocking it to stop the habit. I have hard water and it sounds like it cleans the llime that collects in toilets. I have pets also so pet safe cleaners sound great. I want to for a friend who really needs this one. I like to use any kind of cleaning product that touts a more 'green' way to do your cleaning. And since my dog does like a potty drink every now and then all the better for him. I have 3 toilets on well water. We have lots of iron and calcium in our water so the toilets get a grungy look quickly. From what you've written, it sounds like this is a product that would work well for our household. I would like to try this because I have toilet visitors in my home. This would be so great to have. My pup won't stay out of our toilets. This would really help with our dog! This would be a great new product to try! This would be great as we have a boxer who is constantly drinking out of the toilet, and two cats who enjoy playing in them.